GoSlower.org, Home of the "20 Is Plenty!" campaign. "20 Is Plenty!" 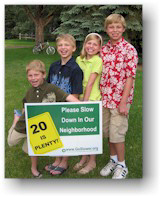 "Go Slower"
The "official" speed limit in most neighborhoods is 25 MPH. But many drivers exceed that limit without even thinking. The "20 Is Plenty!" and the "Go Slower" campaigns are designed to lower the speed of traffic within neighborhoods by asking drivers to make a conscience effort to slow down. The campaign is not a top-down effort to have the police issue more tickets or have the city install speed bumps. This campaign is a bottoms-up, grassroots effort to ask drivers to voluntarily slow down. It's about getting people to participate in an effort to lower the speed of traffic in our neighborhood. It starts with us. Just look in the mirror or across the dinner table or perhaps next door or down the street. We are the problem. It's you, me, our family, neighbors and friends. While "outsiders" can certainly cause problems, the majority of traffic within the neighborhood is generated by the families who live here or live near here. Nicholas, Michael, Anna and David Pavlakovich want drivers to Go Slower.